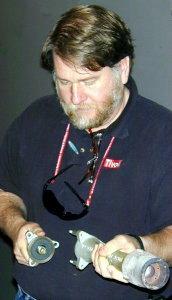 1:00 p.m., March 9, 2002 at Collier Library, 6200 Pinemont, Houston, Texas, President Dennis Cranston presiding. 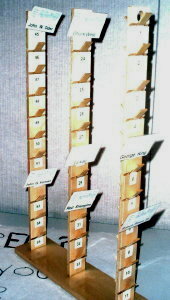 Jan Rowland built a name tag tree for member's badges. There were 40 attendees plus one visitor. 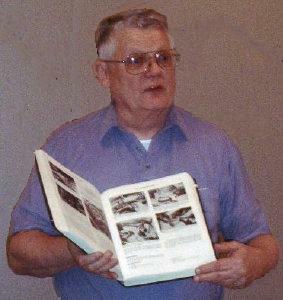 Tom Moore displayed a variety of books from his technical collection. Vance Burns showed a commercial gas burner he bought. 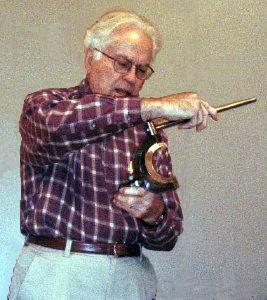 Don Foster showed two ball or radius turning attachments he built for his lathe. Joe Williams demonstrated his version of a welding positioner. 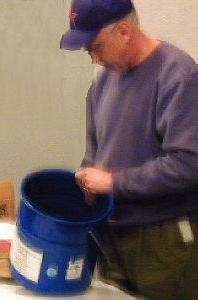 Larry Hill (Mr. Sandman) showed a simple home made muller and his own brand of foundry oil sand he made using it. 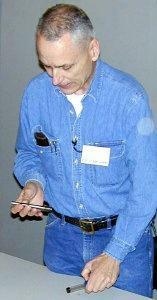 Ray Ethridge showed a very unusual two piece bronze flywheel casting. Very few members had seen a flywheel of that type before. 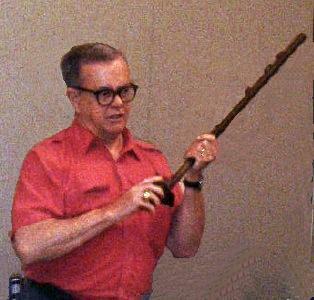 Ed Gladkowski showed an unorthodox tool for turning smooth finishes on a worn lathe. Joe Scott showed a quad drill press head and an example of the results of electro-lytic derusting. Art Voltz displayed an amazing collection of steady rests, a shop sign along with very interesting and ingenious functional wooden mockups of a Lewis shaper vise and 10x24 Logan lathe steady rest he is developing. 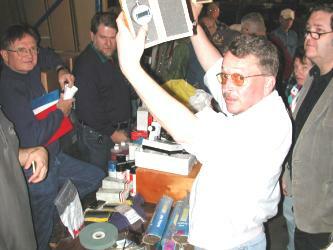 Our swap meet was held in the Rutland Tool company parking lot on Saturday March 23. Later that same day Rutland auctioned off its scratch and dents and customer returns. Thanks to David Adamek, the auctioneer, and the rest of the Rutland gang. David Whittaker of HMSC was responsible for getting the event set up. This is the first of a series of articles that I hope will stimulate some interest and discussion among those members of the club interested in CNC (computer numerical control) machining. As with all machines and machining operations, safety is the most important part of the job. All of the safety precautions used in standard machining also apply to CNC machining. This article discusses some, but not all, of the additional safety concerns with CNC machining. For safety reasons always make at least one dry-run of a new or modified CNC program. The computer will do exactly what it thinks you as a programmer have instructed it to do. Few people go thorough life without having given an instruction that is not interpreted as expected. When a CNC machine does not do what is expected, the results can be damage to the tooling, the work piece, the machine, and even the operator. Tooling hitting something unexpectedly is known as a crash. A dry-run on a milling machine is a execution of the program made without the spindle turning and usually with the table lowered safely out of the way. On a lathe, the dry run is made without tooling, without the work piece or both. The new graphical software systems now available have helped a great deal in program verification. However, in my humble opinion they do not replace the need for a dry-run of the program. Set the mode to absolute or relative movement. 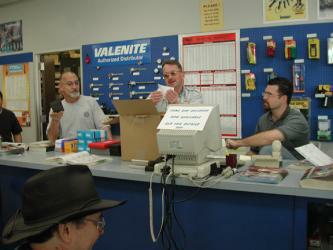 The manufacturer's manuals for your machine and controller should be carefully studied. The manual is a good starting point, but, as with all software documentation, is prone to errors. Do not make the mistake of thinking that a command will work in a particular way on your machine. Not all machines respond the same way to even standard commands. Both coordinates, and data entry methods can be different from machine to machine. Even two identical machines with the same controllers and same software revision can respond differently if the setup file for the software is configured differently. 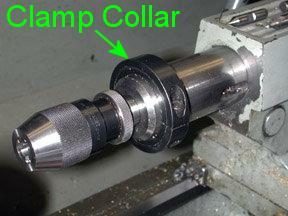 The next article will be about some of the very basic whats and whys of CNC machining. Here is what I use for a cross slide measuring device. Its a poor man's DRO (digital read-out). I appropriated the design concept from John Hoff, another HMSC member. The clamp screw and rod guide holders are made from round metal standoffs that are threaded into the lathe's cross-slide. A 2 in. travel dial indicator and its aluminum clamping fixture are fastened to the rear of the lathe carriage The push rod slides through cross drilled holes in the two rod guides. After the push rod is placed in contact with the dial plunger, the clamp screw is thumb tightened and the initial indicated cross-slide travel is set. The push rod then moves in unison with the cross-slide. Note that the change in reading on the dial indicator is just half the amount removed from the diameter of the workpiece. This is different than that commonly indicated by the collar markings on the cross-slide feed-screw and can lead to some confusion when using this device. 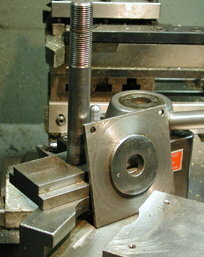 A bolt is used as a tailstock stop. It is threaded into one of the holes in the saddle that are normally used for attaching the follower rest. 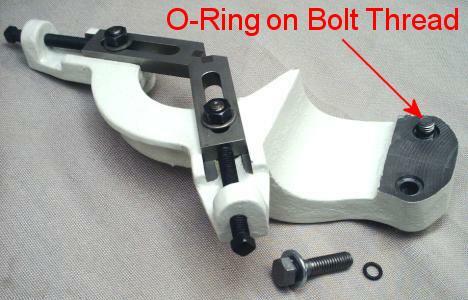 The bolt has a jam nut that sets its exposure just far enough out so that the tail stock casting (not seen) will not collide with nor damage the rod guides and dial plunger when it is pushed up against the saddle. 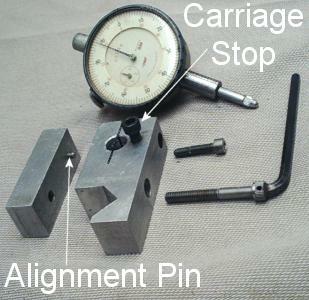 For measuring small movements of the lathe carriage near the headstock, I use a 0.5 in. 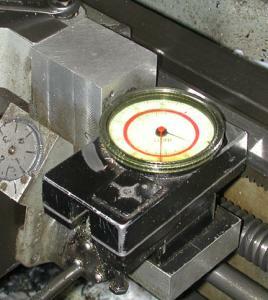 travel dial indicator clamped to the lathe bed. The indicator is quite useful for determining when to disengage the half-nut and withdraw the cutter during a threading operation. The indicator holder is made from aluminum. It has a 3/8 in. hole, expansion slot, and an Allen head cap screw that cinches the dial indicator's slide barrel. The holder's lower clamp bar has an alignment pin that prevents the bar from rotating as the clamp screw is tightened around the lathe's V-way. 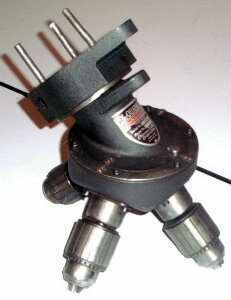 The Allen head clamp screw has a L-wrench silver soldered to it. 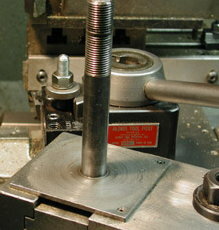 All that is necessary is a quarter turn of this screw to allow the holder to slide along the lathe bed. A carriage stop screw prevents displacement of the dial plunger past full scale. I add a clamp-type collar to the tail stock ram when doing repetitive ram movements with the same tailstock tool . It prevents the inadvertent ejection of a taper shank drill bit or chuck when the tail stock ram is fully retracted by its hand-wheel. 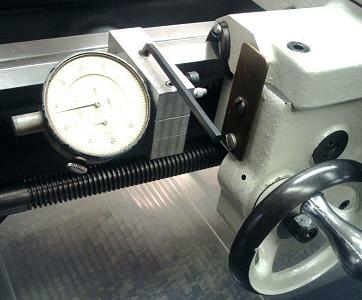 The clamp must be loosened or removed in order to intentionally use the self ejecting feature of the tailstock. I added a rubber bumper, an old oil filter square section ring, to prevent a hard hit of the clamp against the tailstock casting's face. The unit is the mechanical equivalent of the new digital read-outs of today's market. I built an aluminum block bracket to mount the unit to the side of the apron of the lathe. The factory bracket (extra cost) mounted to the top of the apron and it was not suitable. The unit uses a small barrel shaped, lightly knurled, roller that rolls on the side of the way. The mount allows the unit to be tipped slightly to change the reading. I use a known length bar (micrometer standard of 10 to 12 inches) and move the carriage away from the locked down carriage stop. This solves the calibration problem. I did add a plastic cover to the dial to keep hot chips from damaging the original one. The secret of making a clear lens of this type is to add a few drops of clear machine oil to the surface between the two lens. The plastic cover is machined to snap over the factory lens. You can see the paint is rubbed off of the top due to my thumb rubbing the surface while turning the dial to the new Zero setting. 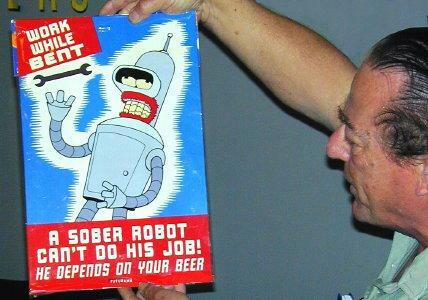 It has 14 years of service and no problems other than an occasional calibration check. An old two inch dial indicator served me for some 6 years before I bought the unit. When I purchased my lathe many years ago, it had the not very friendly British tool holder. I retained the Aloris tool post unit and many tool holders from my old South Bend lathe and had only to adapt the tooling to fit the lathe. The first thing was to make a "T" slot block to fit in the compound and fit a new center bolt. Then I noticed the rotation of the Aloris block was making marks in the top surface of the compound. 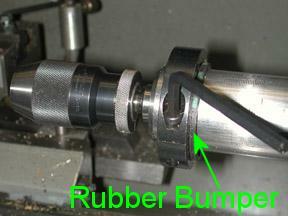 This prompted the machining of the second item, a spacer to go under the assembly. The additional height did not present any problems. It is made from a square section of 1/4 inch thick steel plate with a central boss that fits into an existing circular area in the compound. This keeps the plate centered in the compound's slot and is retained from rotating by two small set screws that go into tapped holes in the top of the compound. One photo shows the assembly and the other one the bottom view of the spacer. The next meeting will be held on Saturday April 13, 2002 at the Collier Library 6200 Pinemont, Houston, TX at 1:00 p.m. Bring along a work in progress to show.